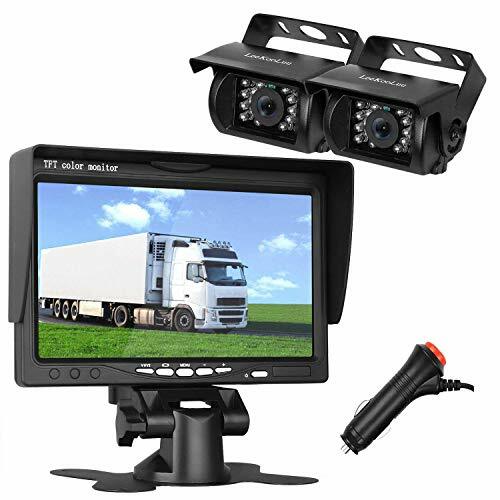 1.This is ideal for cars,Trucks,RVs,Trailers,Campers,Bus, or any vehicle where you want to add a backup camera or see front/side/under vehicle. 4.Monitor viewing is HD color and can rotate the screens upon your needs. 5.Camera is IP68 waterproof and has 18 LED IR lights for enhanced night capability. 6.System can be installed to turn on/off only rear view in reversing or continuous viewing. 7.Monitor has removable bracket with foam adhesive for convenient mounting on flat surface. Bracket can be removed for custom installation.if you want a suction cup mount for fix on windshield,contact us get a free one. 8.The system quick and easy installation for just go through the wire and just plug the charger adapter to cigaratte lighter. 9.50ft RCA cord with extremely durable and waterproof Dealing with extreme weather. Very easy installation. The system be powered by directly connecting to a 12v-24v source cigarette lighter/fuse box/power point/ignition switch for continuous use or reversing rear view use.There is a ON/OFF switch controllable. IP68 waterproof,color HD metal IP68 waterproof camera with 150 degree viewing angle and 7 LED lights.Camera is connected to monitor via direct 50ft 4-Pin wire (provided).IR Night Vision view clearly at night. If you have any questions about this product by LeeKooLuu, contact us by completing and submitting the form below. If you are looking for a specif part number, please include it with your message.